In the 21st century, we have reduced society to doing nothing more than sitting down and looking at endless screens all day. Wouldn't it be nice to get some healthy cardiovascular exercise or just any movement whatsoever in while while watching or interfacing with all these screens? 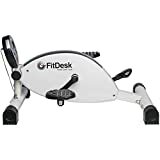 One solution is this cool new FitDesk X1. 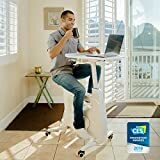 This innovative, lightweight exercise bike has a built-in sliding platform to hold your laptop, book, tablet, and more while you pedal away. 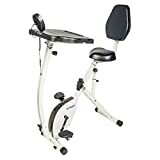 It features a compact folding design, massage rollers strategically placed for daily relief from typing strain, a performance meter w/odometer, a hand-strengthening squeeze grip, and a quiet, twin belt, high velocity flywheel. Great at office, home, or anytime you want to move and be productive. I hope future versions generate power to charge up laptops while pedaling.